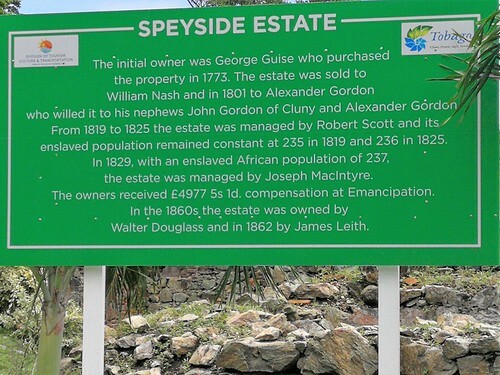 I stood there, reading a sign about who once owned Speyside Estate in Tobago, the smaller island of Trinidad and Tobago. It told me who owned it since 1773, how many slaves they had, and even how much compensation was received for the slaves upon Emancipation. 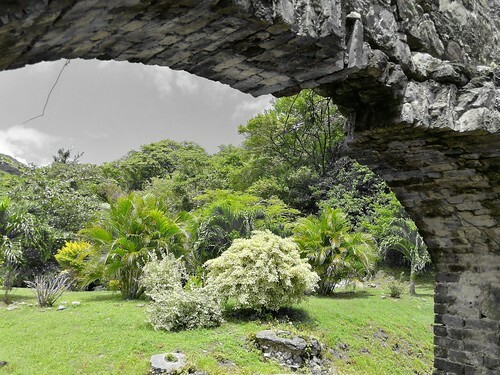 Context is an important thing – I was standing there, reading this, as people of African descent were keeping the area clean – Tobagonians employed, not slaves, but there was an unsettling feeling that I had just gone back in time. The cars didn’t belong. It isn’t hard to imagine that the descendants of the slaves were now making a living keeping the area clean – pristine, in fact. It’s hard to imagine that less than 100 years ago, slaves maintained this Estate. It’s an uncomfortable reminder, one I’d argue is necessary. It’s necessary to feel that discomfort, I think, as an outsider looking in – a witness across the timeline of Tobago. It’s that discomfort, I expect, that causes people to react in different ways, even going so far as to attempt to misappropriate a history not their own by attempting to speak for those who have their own voice. I cannot presume to know anything but that discomfort I initially felt as I read that sign and was surrounded by quiet people who gave me a wide berth, letting the outsider look upon their ancestors’ history. I can write as neither someone who owned nor was a slave, I am of different heritages, seafaring and indentured mixed in my blood. My decision was to not to take pictures with them there, because there was no way I could find to capture that deep feeling I felt when I looked around. It’s all too easy to misinterpret. Some might have called it ‘art’. At the time, in the moment, I saw it as a disservice to those around me. I was the one that didn’t belong. This was their history, this was a history that they maintained, this was something that through the centuries was maintained for reasons beyond me, but left for me to stand there and contemplate. And it was beautiful. In fact, not having visited Tobago in 32 years, the pristine cleanliness of Tobago struck me, but here at this Estate there was a different sparkle, a tie to a time when things changed in 1833, where the numbers of owned people was noteworthy enough to keep in a ledger to later be reported on a green sign in front of me. It was a shorthand for an embarassing aspect of humans and our capacity to treat others so… inhumanely. The black and white history of the bricks was being replaced with the living color maintained by these Tobagonians. They had left here a lens through which to see their history, their culture, in the crumbling bricks of a retired watermill and it’s surrounds. These scars of our histories are something some wish to remove. I do not hold an opinion on such things when it relates to history not my own, but what I will say is that I have a fondness for scars, I see a beauty in them not for the harshness of the wound but for the healing afterward. It takes more strength to heal than to wound, and we need to remember what caused the scars to recognize the paths some have had to travel to be who they are, to be who they will be. That discomfort was a gift. Next > The Bananaquit And The Hummingbird.